Swallow is our most widespread, and most numerous, summer migrant. The maps show that they are almost ubiquitous, but in the last twenty years have been lost from 23 tetrads, noticeably in built-up areas including the east Wirral conurbation, the Mersey valley towns and Macclesfield; proof of breeding was difficult to obtain in Northwich, Chester and Crewe. Their preferred habitats for feeding are pastures, meadows and areas of water where flying insects are most abundant. In this survey, nearly all of the habitat codes submitted were farmland, mainly grassland, or human sites, predominantly rural. They especially follow large grazing animals, partly because of the insects attracted to the animals themselves, and partly because they disturb insects off the ground. In good weather they take roughly one insect every six seconds, preferentially seeking out large flies such as horse flies and hoverflies, which they are well able to distinguish from wasps – quite a feat whilst flying at 25 miles per hour (Turner 2006). 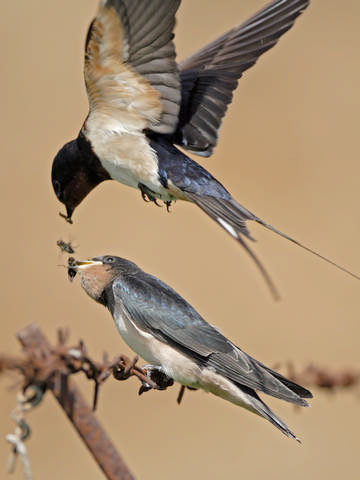 Swallows are conspicuous birds with little fear of man, and it is very easy to prove when they are breeding. Nests are usually in the dark corner of a building, particularly those housing livestock, and it is amazing to watch their aerial prowess as they swoop from a bright summer’s day into a dim shippon or stable without apparently pausing, often manoeuvring through narrow gaps such as broken window panes. Swallows are semi-colonial, and there may be ten or more pairs at favoured sites, but they defend an area around their nest and normally use separate buildings, or at least the opposite ends of a large barn. Most pairs have two broods, frequently re-using the same nest, with the first-brood chicks often helping their parents with the later broods including feeding their younger siblings, no doubt good practice for their own future life (Skutch 1987). Their population fluctuates somewhat, perhaps connected to conditions in the Sahel prior to the birds’ spring passage through West Africa on their way back from their south African wintering grounds (Robinson et al 2003). Such variations are rather unlikely to have made much difference to their distribution, because in years with peak numbers, more pairs settle on favoured farms rather than establish new colonies at sub-optimal sites (Møller 1983). There is no explanation for their loss from the urban Mersey valley and east Wirral sites. Since the arable-pastoral polarisation of agricultural practice, Swallows have declined in the east and risen in the west of England (Evans & Robinson 2004). The BTO analysis of BBS results shows them at their highest density in the agricultural southwest of the county, with a breeding population of Cheshire and Wirral in 2004-05 estimated at 43,620 birds (28,230-59,020). This figure, an average of 72 birds per tetrad with confirmed and probable breeding, amounts to 1.9% of the national population (Newson et al 2008) and suggests that Cheshire may well be the Swallow capital of England. Four Swallows were recorded during the winter Atlas period: Gowy Marshes (SJ47G) on 20 February 2005; Fiddler’s Ferry (SJ58M) on 31 January 2005; Hankelow (SJ64S) on 10 December 2006; and Edleston (SJ65F) on 20 December 2006. There are only four birds on record from later in December: on 26 December 1941, 26 December 1995, 22 December 1996 and from 18 to 22 December 2001, with none ever before in the county in January or February. The earliest spring date is 8 March, in 1976 and 2001 (CWBRs).